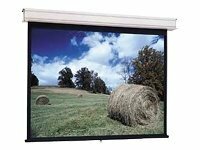 Da-Lite Advantage Manual With CSR Projection Screen, Matte White, 16:9, 133"
The Advantage Manual is a ceiling recessed manually operated screen. Developed with the installation process in mind, the Advantage Manual Screen with CSR provides the convenience and flexibility of installing the case and fabric/roller assemblies at separate stages of construction. A floating mounting method utilizing adjustable roller brackets is designed into the lightweight, extruded aluminum case allowing the centering or offsetting of the screen. The Advantage Manual screen is equipped with the patented CSR system. Offered exclusively by Da-Lite, CSR ensures a quiet, controlled return of the screen into the case. This hands-free feature provides optimal performance and smooth consistent operation. Matte White is the most versatile screen surface and the premier choice when ambient light is controllable. It evenly distributes light over a wide viewing area while colors remain bright and life-like, with no shifts in hue. Screen surface can be cleaned with mild soap and water. Flame retardant and mildew resistant.